Surgical rejuvenation procedures, including facelift and brow lift, can offer patients an excellent way to obtain a dramatically more youthful appearance. If you’re in your 20s, 30s, or 40s, however, you may not need such an aggressive approach. The beginning of fine lines, mild to moderate sun damage, and other early signs of aging often can be addressed with our state-of-the-art laser treatments, which are designed for minimally invasive aesthetic enhancement. Even more impressive, they usually can do so with little to no downtime or discomfort. 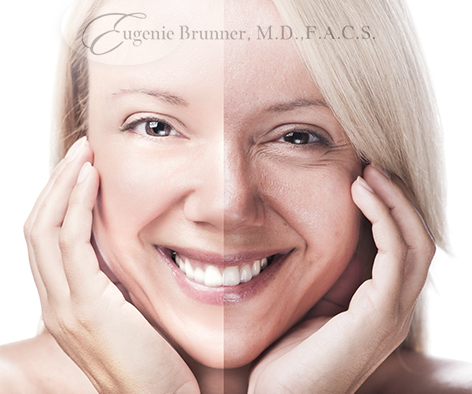 Dr. Eugenie Brunner is extensively trained in the latest laser technologies, and two in particular are designed to provide significant revitalizing effects: Clear + Brilliant® and Fraxel® DUAL. The Clear + Brilliant® laser is one of the best modalities for treating fine lines, mild pigment irregularities, and uneven texture. When you arrive for your initial consultation, Dr. Brunner will examine your areas of concern and determine if this approach can help you achieve your goals, either as a single treatment or as part of a more comprehensive treatment plan. The Clear + Brilliant® utilizes the 1440 and 1927nm wavelengths. It typically takes approximately 30-45 minutes to complete and can address concerns on the face, neck, décolletage, and arms. This is one of the best options for preventive and maintenance care, and side effects usually will be minimal and may include flushed skin and mild tenderness, such as you would experience with a light sunburn. Because the recovery is minimal, you can return to work the next day. This effective laser treatment can be done as a series, in four week intervals, or as a stand alone treatment. A similarly gentle yet typically effective laser is the Fraxel® DUAL, which also utilizes two wavelengths during treatment, either 1550nm or 1927nm. When combined, they can address a broad range of concerns, including fine lines, large pores, pigmentation, dull skin, as well as other common signs of aging. The Fraxel® DUAL goes little deeper into the skin to provide more skin tightening and treatment of fine wrinkles. The recovery consists of two to three days of mild swelling and dry skin, which can be covered with a little make-up. Both the Fraxel® DUAL and the Clear + Brilliant® are designed to be versatile, and, unless Dr. Brunner suggests otherwise, they can be used all skin tones. If you have additional questions about these or other laser treatments available at our state-of-the-art laser center, or if you would like to schedule a consultation with Dr. Brunner, please contact us today.